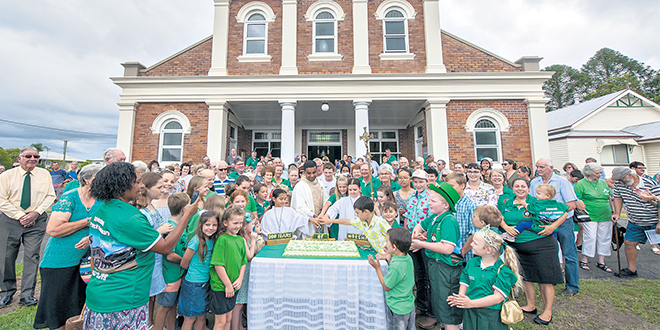 Centenary: A field of green parishioners gather with Our Lady of the Valley, Gatton Laidley parish priest Fr Noyichan Mamoottil around the cake as part of the church’s centenary celebrations. FOR 100 years, Catholics have gathered to join in the “light from Christ” at St Patrick’s Church, Laidley. And historically, it has also been a place where that light was shared. Our Lady of the Valley, Gatton Laidley parish priest Fr Noyichan Mamoottil said he recently did some digging into the history of the parish. He said Fr Patrick Fouhy built St Patrick’s in 1919 after a fire destroyed the earlier church on the site. “He (Fr Fouhy) was responsible for getting people and the community together in 1919,” Fr Mamoottil said. And now, in 2019, only three years after Gatton and Laidley parishes merged, the centenary of St Patrick’s was again a focal point of faith bringing people together again. The centenary events have seen people from all around united in shared identity. “We’ve always been separate communities, but the more we celebrate, the more we have these opportunities of celebrations, the more we come together,” Fr Mamoottil said. The parish is celebrating a host of events for the centenary throughout the year. The first event was the lighting of the centenary candle and introducing the centenary prayer on March 10. The day was also a time where former parishioners and church servers gathered to tell stories and reminisce about their time. The following weekend was one of the main events of the year – St Patrick’s Day. Parishioners fielded green outfits in the church for Mass and gathered afterwards to cut their centenary cake and collectively form the shape of a 100 for a centenary photo. Fr Mamoottil said St Patrick’s Day was an inclusive blending of people, where young, old, school children and parents gathered as one. And the core message of the celebrations was clear for Fr Mamoottil. “As Christians, as Catholics, we are receiving light from Christ and we’re going to be his light in our community and in our family,” he said. St Patrick’s Day also brought with it grey rainclouds after eight months of the parish praying for rain. Fr Mamoottil said he would have loved for the grass to turn green, like the crowd of people wearing green for the occasion. And although it wasn’t enough rain to do that, it was a sign of hope for the community. Fr Mamoottil said St Mary’s Primary School, Laidley, and Our Lady of Good Counsel School, Gatton, were supporting the events. And more events were set to follow for the rest of the year, including a parish sports day in late May where the school and parish teams will face off in Kanga cricket. The Centenary Mass will be held on October 27 and celebrated by Brisbane Archbishop Mark Coleridge as part of a parish visit.